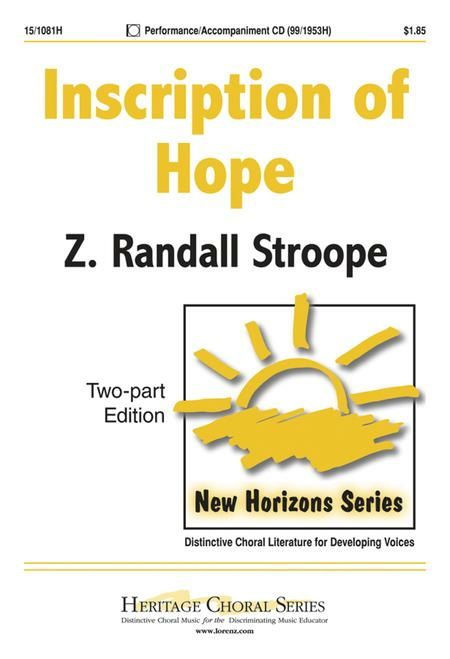 Composed by Z. Randall Stroope. Choral. 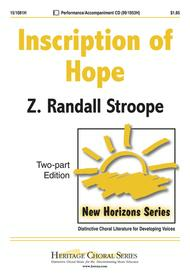 New Horizons Series. Concert. Octavo. Heritage Music Press #15/1081H. Published by Heritage Music Press (LO.15-1081H). The elements used to create this piece came from diverse sources, including fragments of a Russian folk melody and a Jewish text, but the message is universal: hope and firm belief will eventually reign victorious over the greatest of odds, be they prejudice, hate, or fear of death. Limited ranges, an a cappella middle section, and a brief narration all contribute to the effectiveness of this accessible song of hope. we sang this song for my high school. it got rave reviews from the adults, but the students were not impressed. i guess that they did not connect with the song. i personaly love this song! 21 of 45 people found this review helpful. I first heard this piece at a concert for the Chattanooga Boys Choir. I was so inspired and touched by it that I decided to purchase it for my own church choir. 16 of 41 people found this review helpful. A moving setting of striking words, this effective piece avoids sentimentality. It would work well in a themed concert of peace or human rights issues. 20 of 43 people found this review helpful. The Badger State Girls Choir sang this song last year for their spring concert in 2007 and it was a big hit. With 3 soloists, it was wonderful. I am part of the BSGC and I'm singing this song @ my church pretty soon. 15 of 37 people found this review helpful. 17 of 39 people found this review helpful.